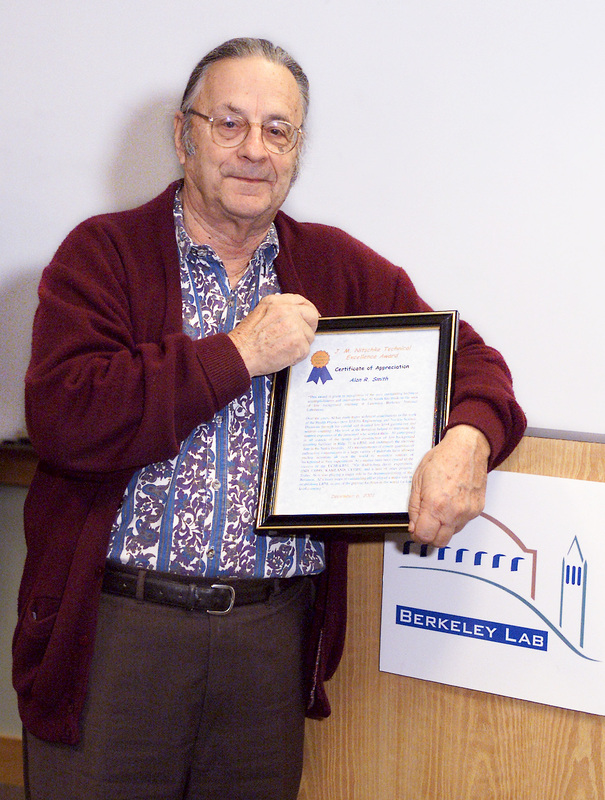 Alan Smith set the gold standard for low background counting—a standard that guides the BLBF at Sanford Lab today. Alan Smith (right) explains data recorded at the Oroville facility, where the first-generation dark matter and neutrinoless double-beta decay experiment was housed. Seated next to Smith is Dave Martinez, key account manager for AMETEK ORTEC. (Circa 1994.) Photo courtesy of Lawrence Berkeley National Laboratory. In 1953, Alan “Al” Smith arrived for his first day of work at Lawrence Berkeley National Laboratory (Berkeley Lab). Over the next seven decades, Smith advanced the science of low-background counting, working to push the capacity of detectors to see ever more minute signatures. He officially retired in 1994, but continued to come to the lab until 2018. By age of 92, Smith had created a “gold standard” of gamma-ray assay counting at Berkeley Lab and established a legacy within particle and nuclear physics research communities. “Al’s career has always been in the background of nuclear science—literally,” said Keenan Thomas, Nuclear Counting Facility Manager at Lawrence Livermore National Laboratory, who was previously mentored by Smith at Berkeley Lab as part of the Berkeley Low Background Facility (BLBF) team. Rare-event searches, such as the Majorana Demonstrator’s search for neutrinoless double-beta decay or LUX-ZEPLIN’s (LZ) dark matter hunt, don’t just need to be shielded from cosmic rays—they also require some of the world’s cleanest materials. By “clean,” researchers mean radio-pure; they are looking for materials with the lowest concentrations of radioactive elements. As radioactive elements such as uranium, thorium and potassium decay, they emit signals that quickly light up ultra-sensitive detectors and overwhelm rare-event signals. To lessen these misleading signatures, researchers use low-background counters (LBCs), which can detect even the tiniest amounts of radioactivity and assay all materials and components. Smith’s career both paralleled and propelled advances in low-background counting. When Smith began his work in the 1950s, nuclear science was relatively new and booming, with many measurements yet to be made. The Bevatron particle accelerator came online at Berkeley Lab in 1954, and Smith was initially tasked with assessing the stray neutrons it produced. To do this, he placed large aluminum discs called “activation foils” around the perimeter of the Bevatron to “capture” neutrons that scattered from the accelerator. By assaying these foils later with sodium iodide detectors, Smith determined the amount of neutrons produced using weak signals from the trace amounts of radioactivity generated in the foils. Smith places an aluminum disk sample exposed to radiation at the Bevatron into a lead and concrete box containing a detector at the low-level radiation counting facility, circa 1950s. Smith realized that the Bevatron itself created a dynamic background, which clouded the measurements. To reduce this noise, a low background “cave” was constructed using a single pour of concrete, with walls ranging from 4-6 feet thick. 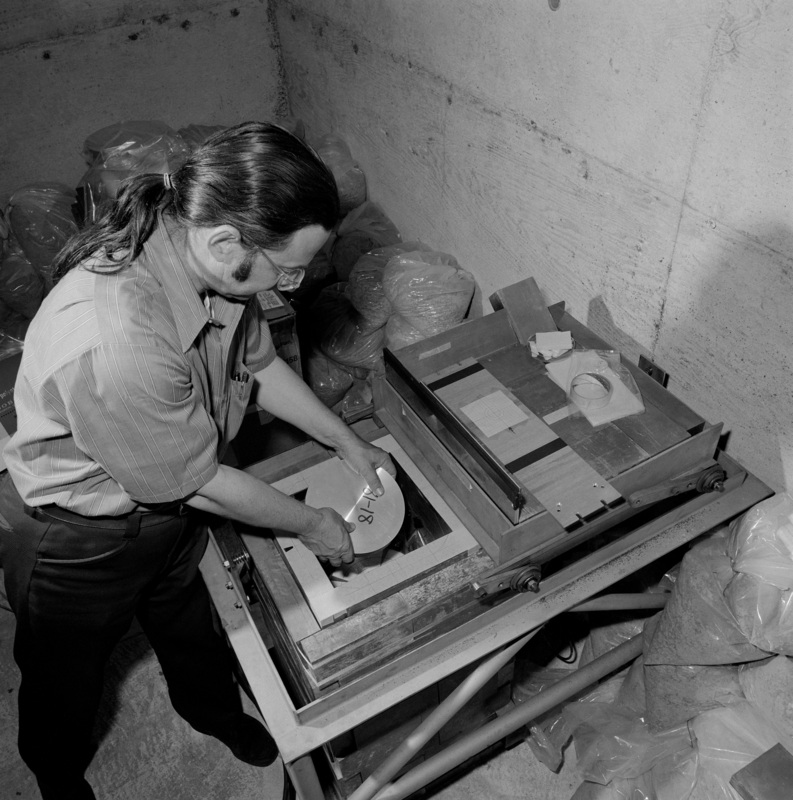 Smith and a graduate student, Harold Wollenberg, carefully counted dozens of samples of concrete source materials to find a supply with the lowest levels of naturally occurring radioactive elements. The dense walls reduced external backgrounds from the Bevatron, cosmic rays and natural radioactivity in the environment—all with the benefit of not emitting a significant amount of background themselves. This cave became the surface location for the Berkeley Low Background Facility (BLBF) and is still in use today. In the 1980s, Smith became involved with the University of California-Santa Barbara and Berkeley Lab double-beta decay experiment, which used high-purity germanium detectors. Originally installed in the low-background cave at Berkeley Lab, researchers soon realized the backgrounds from cosmic rays were still too high. Smith turned to his professional connections at the underground Hyatt Power Plant at Oroville Dam, to secure a space for the experiment to relocate a few hundred feet below ground. The underground space supplied sufficient overburden for the experiment, and transitioned into a remote location that housed low-background counters for BLBF for decades. In 2014, the BLBF at Oroville was relocated to the Black Hills State University Underground Campus (BHUC) on the 4850 Level of Sanford Lab. Before the move, Smith assayed hundreds of samples from the 4850 Level, including natural rocks, concrete, shotcrete, paint and other materials to determine what kinds of backgrounds existed. His attention to these samples from the underground construction of the Davis Campus created ample material-radiopurity data that researchers now use in simulations for Sanford Lab experiments. Once the transition to BHUC was completed in 2015, Smith and his team received and analyzed data online at Berkeley Lab. Today, the BLBF performs low background counting in its two unique facilities—the surface site at Berkeley Lab and the underground site at Sanford Lab. Researchers assaying their materials from a distance can monitor results in real-time, while relying on daily support from BHSU faculty and students and Sanford Lab staff. Support includes changing samples in the detectors, monitoring the liquid nitrogen systems that purge radon from inside the detectors and assistance in the installation of detectors underground. Both facility locations owe much of their design and creation to Smith’s meticulous measurements. Throughout his career, Smith pushed the capabilities of low-background counting, striving to make more and more sensitive measurements. As technology advanced, his methods of detection graduated from sodium iodine (NaI), to germanium lithium-drifted (GeLi) and eventually to high-purity germanium detectors (HPGe). With each advancement, his methods became more sensitive and intrinsic backgrounds needed to be reduced even further. Reducing backgrounds necessitated knowledge in the natural radioactivity of common materials used in the shielding and detectors themselves. As he measured countless materials for various projects, Smith developed a deep expertise that became crucial to research into neutrinos, neutrinoless double-beta decay and dark matter—experiments that required extreme radiopurity in detector materials to detect extremely rare, weakly-interacting signals. His vast knowledge of the backgrounds in common materials, including metals, composites and ceramics, brought many researchers at Berkeley Lab to him first when designing experiments. Researchers would ask what they should use to create a component of their experiment, and Smith would quickly point them toward the materials with the lowest levels of natural radioactivity. Smith displaying the Michael Nitschke Award for Technical Excellence he received in 2001. Photo courtesy of Lawrence Berkeley National Laboratory. When Smith left Berkeley Lab in 2018, he had contributed to dozens of high-profile physics experiments—including Nobel Prize-winning SNO, KATRIN, the Daya Bay Reactor Neutrino Experiment, LUX [see below], LZ [see below], Majorana [see below], CUORE, DM-Ice, LBNE (the precursor to LBNF/DUNE [see below]), Double Chooz, KamLAND, and more—all while living in the background. Sanford Lab benefits tremendously from the impacts of Smith and his team. His scrupulous records of underground backgrounds inform researcher’s simulations, while the materials he screened are part of the the Majorana Demonstrator and LZ dark matter detectors. Most notably, his influence is seen at the BLBF on the 4850 Level, where six low-background counters quietly collect data using high-purity germanium detectors. Here, the same detectors once used for measuring materials for LUX and the Majorana Demonstrator will continue counting for next-generation experiments, including LZ, LEGEND and the Deep Underground Neutrino Experiment.